DETOUR contains remarkable insight on how to deal with change and provides solutions to reduce stress, eliminate fear and increase performance. A BOOK THAT WILL TRANSFORM YOUR LIFE! The book DETOUR is totally off the charts! A masterful manuscript on how we all need to clearly look at change in the workplace and away from work. 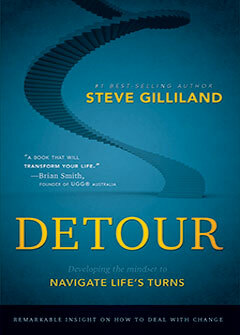 DETOUR will help you find the hidden opportunities in unwelcome change. Steve Gilliland takes you on an amazing journey and shows you how to feel more in control when the change is out of your control. Sure to be another best seller!